An outbreak of E. coli poisoning has expanded to Tennessee, where one more person has been sickened after eating romaine lettuce grown on an Arizona farm. The federal Centers for Disease Control and Prevention says there are 23 confirmed cases of E. coli and seven probable cases connected to the tainted lettuce. That is up from 19 confirmed by CDC earlier this week. The rest of those sickened live in Michigan, Ohio and New York. Many of them were middle school, high school and college students who ate in school cafeterias. The CDC said there are 10 confirmed cases in Michigan, eight confirmed cases in Ohio, four confirmed cases in New York and one confirmed case in Tennessee. All of those sickened became ill before late April. The strain of E. coli involved in the outbreak is rare and difficult to diagnose, so there may be more unreported cases, officials have said. There have been two recalls of romaine lettuce related to the outbreak, both by distributors who bought lettuce from the same Yuma, Ariz., farm. Ohio-based Freshway Foods announced a 23-state recall of romaine lettuce last week, while Vaughn Foods of Moore, Okla., announced a recall Monday. Vaughn Foods bought its lettuce from California-based Andrew Smith Co., a supply company which shipped the lettuce after purchasing it from the Arizona farm. The Food and Drug Administration, which is investigating the outbreak, has so far declined to give the name of the farm. 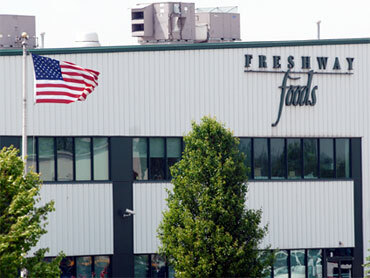 Andrew Smith Co. would not say if they supplied romaine lettuce to Freshway Foods. Amy Philpott, a spokeswoman for Andrew Smith Co., said the company did sell the lettuce to an additional distributor in Massachusetts but would not identify that distributor because the lettuce is already past its expiration date. The FDA said it is still attempting to determine the point in the supply chain where the contamination occurred, since it went through several facilities before it was eaten. As a supplier, Andrew Smith Co. buys bulk romaine lettuce from farms and sells it to distributors. Those distributors, such as Freshway Foods and Vaughn Foods, then sell it to food service outlets or retail customers. Many of those who became ill were college students in the three states. Middle and high school students in New York were also sickened, including a 15-year-old and a 17-year-old who developed hemolytic uremic syndrome, which can cause bleeding in the brain or kidneys. Local health authorities in Dutchess County, N.Y., where the students fell ill, said they are all expected to make a full recovery. The E. coli was discovered by New York health authorities in a bag of Freshway Foods shredded romaine lettuce last week after they had been investigating the outbreak in the schools for several weeks. Most of the lettuce recalled was sold to food service establishments. The recall does not affect bagged lettuce in the grocery store.